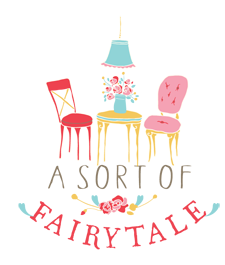 A Sort Of Fairytale: Cottage Industry - A New Business Venture! 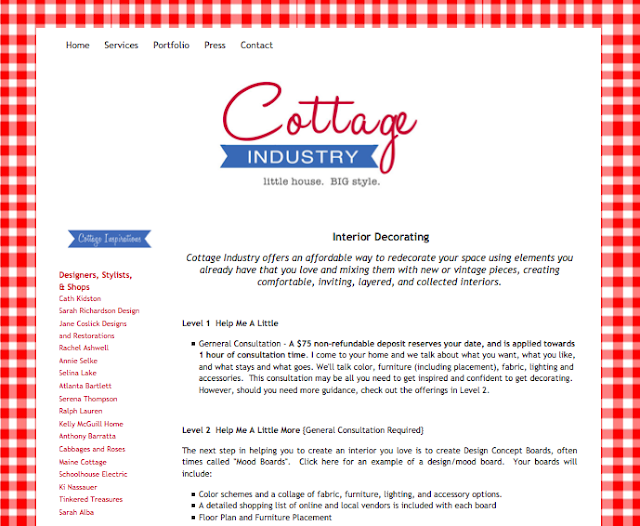 Cottage Industry - A New Business Venture! 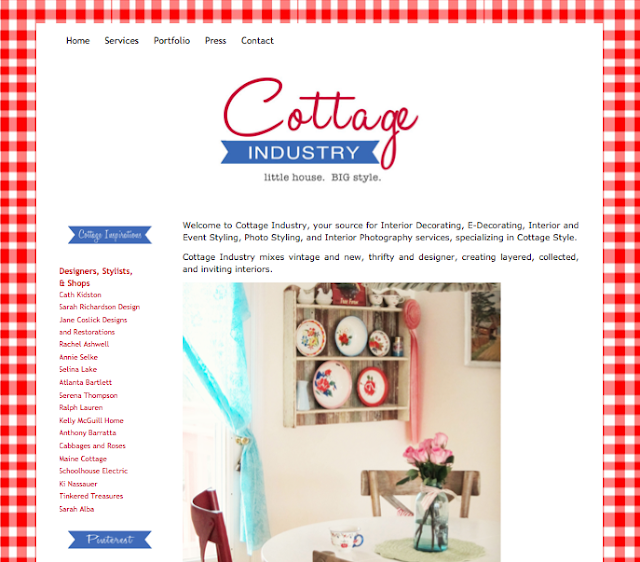 I have just launched a new website, Cottage Industry, that offers my services in Decorating, E-Decorating, Styling, and Interior Photography with a focus on Cottage and Vintage Styles! I have been working on the site and ideas for a couple of months, but the idea, er little dream has been in my noggin' for much longer than that. Over the years, I have had many careers, most in a creative field of some sort. The most recent "job" (other than full time mom) I have had is selling vintage and handmade wares at vintage markets, flea markets, and on Etsy. Although I have enjoyed that and it's been a learning experience, I've come to realize what I love most is not selling, but decorating, styling, and photographing. That's probably why I love blogging so much...you have the trifecta there! So, having figured all that out (hmmm, only took me 35 years), I decided to create my own decorating business offering Local and E-Decorating, Styling, and Interior Photography services. "Welcome to Cottage Industry, your source for Interior Decorating, E-Decorating, Interior and Event Styling, Photo Styling, and Interior Photography services, specializing in Cottage Style. Cottage Industry mixes vintage and new, thrifty and designer, creating layered, collected, and inviting interiors. Cottage Industry loves cottages of course, but can transform any interior: urban, suburban, rural, and vaction homes, as well as retail shops, and work spaces. Although comfortable, cottage style is my signature, I am not limited to one style. Other specialties include: Coastal and Beach Style, Shabby Chic, French Country, Swedish Country, Classic Casual, Rustic and just about anything that incorporates vintage elements. My design recipe is to work with what you already have, add a dash of new, sprinkle with color, and mix well." As mentioned above, my specialty is cottage style, but I am not limited to just that. Really, the only thing that wouldn't be my forte is ultra modern and sleek...that's just not a style I can relate to. Anything else pretty much goes! I know many of you bloggers and readers are savvy in the decor and DIY department, so you may not be needing my services, however I'd be very thankful if you chose to spread the word about Cottage Industry via your social networks and/or grab the button below for your blog! As a little celebration of the "grand opening" I am hosting a Decorating Giveaway! 1 Custom E-Design Board/Inspiration Mood Board for 1 Room of their choice. Board will include color schemes, fabric, furniture, lighting, and accessory options, as well as, resources/links to products for you to purchase if you wish. Good Luck on the giveaway and thanks so much for coming by to check out my new business! congratulations on your new venture! the new site looks fabulous! ...and followed on pinterest! my fingers are crossed! Congratulations on seeing your dream into reality! Your website is beautiful...love the red, white and blue! I am following all of your Pinterest boards!! I like Cottage Industry on Facebook! Oh Stacey, I so admire you for going after your dreams! Your website looks amazing ~ you did a wonderful job designing it. I just know you are going to be very successful!! Good luck - I just checked it out and it is adorable! I "liked" you on FB too ! I added the button to The House on Lavender Hill - but I don't do Pinterest .... wait, let me rephrase that, I LOVE pinterest, but my version is to save the pictures I love in idea files on my desktop so I can get to them even when i don't have internet !!!! Love the new site, it looks great! The photos look amazing. ......and I'm following it on Pinterest! Good luck with your new site, Stacey! I hope you will share redesigns with us. i will be happy to help spread the word about your new venture and wish you much success. no need to count me in on the giveaway -- i already have my prize -- the sign! Congrats! I know it's going to be a success! Congratulations. Your site looks great. I love your "design recipe". I'll definitely grab a button for my blog and help spread the word. Good luck! I am so happy for you to be following your dream!! Your site looks wonderful and if very easy to get around. Goodness I would love your talent hand in helping me with one of my rooms!! I am following your lovely boards on Pinterest too! ps Visited CI-- looks great! it's looking puuuurrrrrdy, stacey. what a terrific idea! like ya on your new fb page! heading over to check out the new pinterest account now - I'm sure I'll LOVE it! Your site is very professional looking and pretty, Stacey! Is it on Blogger or Wordpress? I've come to understand the same about myself. I don't really want to sell. I want to decorate. Different strokes for different folks (like us), I suppose. Very exciting. Good luck on your new venture! Congratulations. Loved the site. Can you follow it. AH! I'm so excited for you Stacey!!!!!! I signed up to follow on Pinterest. great business venture and website...congrats! thanks for the opportunity to enter your design giveaway. I hope you don't mind but I know you'd want to know that there's a typo on your site. You have vaction instead of vacation. Great site and I like the changing photos. Is it wordpress? congratulations and best wishes to you in this new venture. i know you will do great. you have such a great style. i am so excited for you stacey!! Visited the website - how fun is this endeavor?? Best of luck!! The new venture and site look fantastic. Good Luck! Wow, Stacy! I am so happy that you are going for it! I am sure you will be successful! Your blog is great and this is where your passion is so enjoy it! Oh, I had already liked your facebook page! I need to make sure I am getting updates. Stacy, Your Pinterest is great! I am following you there, too! Your new site looks awesome!!! Congratulations!!!!! Love your pins already! Following you on pinterest, too. So happy for you! Nothing more fun than starting a business! Congrats!! I love your new site, so cute, so you! 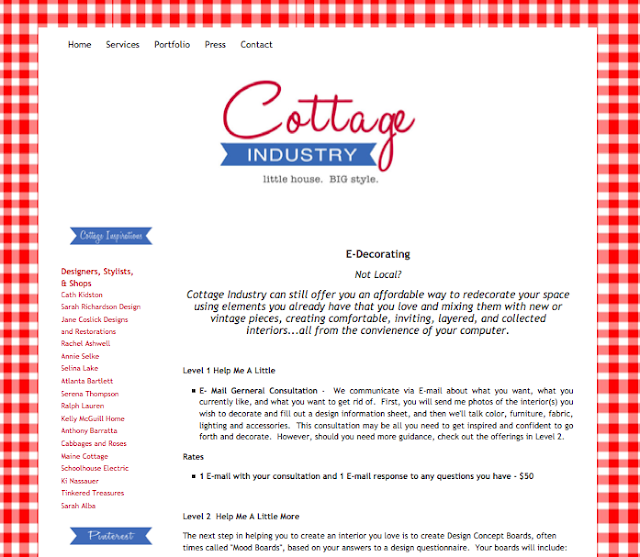 I am following Cottage Industry on facebook. I am following Cottage Industry on Pinterest! YAY! You go girl!!! It takes a lot of courage to put yourself out there and go after your dreams. I wish you the best of luck (I know you've got the talent) in your newest venture! Yippie - you're going for it!! You will be a superstar and I wish you the best of luck! Just checked out the new site - loved looking through the photo gallery!! Just "Liked" you on facebook, too. And I'm following you on Pinterest too! Checked out the new website. NICE! Your style & my style totally mesh! I visited Cottage Industry. Thanks for the chance! I follow Cottage Industry via Pinterest. COOOOOOOOOOOOOOOOOOOOOOOOONGRATS MISS Fairy!!!!! I wish you the absolute BEST in your new venture...I will be watching...I know that there are GREAT things in your future!!! sending cottage hugs to you and yours! I've liked Cottage Industry on FB. 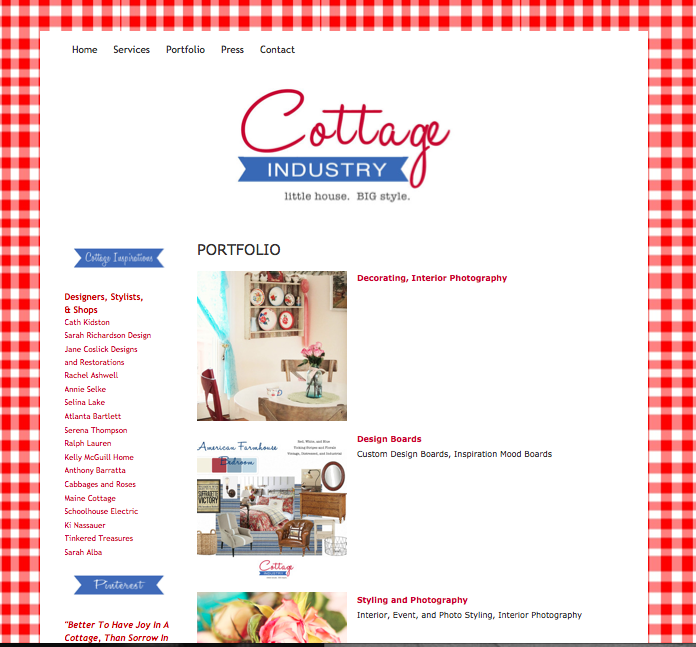 And I'm proudly displaying the Cottage Industry button on my blog sidebar! I visited 'Cottage Industry'. Great look and best wishes for your success! Also, hope I win ! SO in awe of you!! :D You had a dream and made it happen!! Just LOVE that!! ONLY the BEST wishes and thoughts for you Sweet one!! You are going to do Amazing! Hi, I'm stopping by from Susan's Maple and Magnolia blog. Love your design boards. My favourite aspect is that you incorporate beautiful colours and fabrics and make it all work. I visited Cottage Industry and the design boards are my favourite part. I liked Cottage Industry on Facebook and follow on Facebook. Thanks for the chances. Good luck on your new adventure. I like your style and I'm glad, for you, that you are doing what you love. I use blogs like yours for inspiration in my own home. Knowing what you like is first step to starting your own business. Always go for the one that you know best or one that you’re most familiar with and the one that you’re sure that you’ll enjoy doing. Managing a business is also about passion. Go where your heart is and you’ll never get tired of working.